I really enjoy decorating for fall, but I don’t like spending a ton of money to do it; I’m a junker after all. When I got out my decorations this year I really felt like I needed a little something more to put in my kitchen. I really like the buttermilk colored pumpkins, but I do not like how much they cost. So, I made a trip to the dollar store to see what I could find. As you can see, they were not pretty and I wasn’t sure if I could improve them at all. I decided to use some off-white chalk paint that I had left over from another project, just to see what would happen. Whatever that orange coating is, it was plastic-y and I was afraid the paint would just pool up and not stick. I did have a little trouble with that, but it was not as bad a I thought it would be. After about three full coats, they looked pretty good. I used a little brown gel stain to add some age/shading to them after the paint had dried. After the pumpkins were painted, I used some copper craft paint that I already had (I have a paint problem!) to paint the stems. When they were done, I still felt like they needed a little something, so I went digging around in the bottom of my fall decorations tote to see what sort of goodies I could find. I NEVER throw away the little bits that fall of the fake flowers, picks, garlands and greenery…I just stick them in the tote. There wasn’t much in there, I must have used them for another project, but I found enough to make it work. I poked the ends of the bits into the pumpkin and used straight pins to hold them in place. They are not the finest piece of art I’ve ever created, but for 3 bucks and a little time, I’m pleased with the result. I love to hear what other people are doing; so, what sort of fun fall crafts has everyone else been working on this year? I’ve been working on a couple of thrift store finds that I’m quite excited about. I’m turning two candle holders into plant holders…plant art…plant sculpture? I’m not sure what to call them, but I’m pretty happy with the end result. The first one is a wall mounted piece that cost me about three dollars. It has the little spikey things in the bottom of each circle that is supposed to hold a candle. I thought about trying to cut them out, but since I used pots with drain holes in the bottom, they don’t pose a problem and I left them as is. I painted the candle holder with some copper spray paint I had left over from my daughter’s wedding. (She did copper before it was “in” and I had to spray paint some of the decor; she’s always been on the cutting edge of cool) The pots are just inexpensive terra cotta pots that I picked up for eighty cents apiece at the home improvement store. I painted them with the white latex paint that I always have around the house. When the pots are in place, they tip forward just a bit; not enough to fall out, but I secured them to the frame with some copper wire just to be sure. I still need to hang it on the wall, but I think it will look fantastic! The second one is a table top candle holder. It was also about 3 dollars and it did not have spikey bits. (Yay!) I sprayed it with off-white paint that I had from another project. I should mention that I sealed both candle holders with a matte clear coat. These pots are also from the home improvement store. The bottoms of them are painted with some gray “oops” paint that I bought at Menard’s for fifty cents. ( I always head back to the paint department when I’m there, I’ve found some really great colors) The rim of the pots were painted with some craft paint that I also had left over from the wedding. I thought about adding some highlights on the stand, but I really like the simplicity of it so I’m going to leave it as is. Now that these items are done, I’ll be working on a small shelving unit and a couple of projects with burlap coffee bean bags. I’m also in the process of reorganizing my shop, so I’m keeping busy but look for another post soon! It has been a while since I posted anything on this site but that will be changing in the near future. I have been working on some home redecorating projects and some smaller projects that I need to write about soon. In next week, I should have my entryway project finished and I’ll be able to post all the before, during and after pictures. I’ll talk about how my tendency to save things that I can reuse or up-cycle meant that the whole project came in under $100 dollars! I’ve also been scouring Goodwill and other exciting places (yes, Goodwill is exciting). I’ve found a few gems that I’m working on redoing now; I’ll write about those too! I’m also working on some next steps and hoping that I can find a way to turn this into my full time gig. Life has been busy. I started a new job and am studying for certification exams; it hasn’t left much time for creating or writing. But today I got inspired. 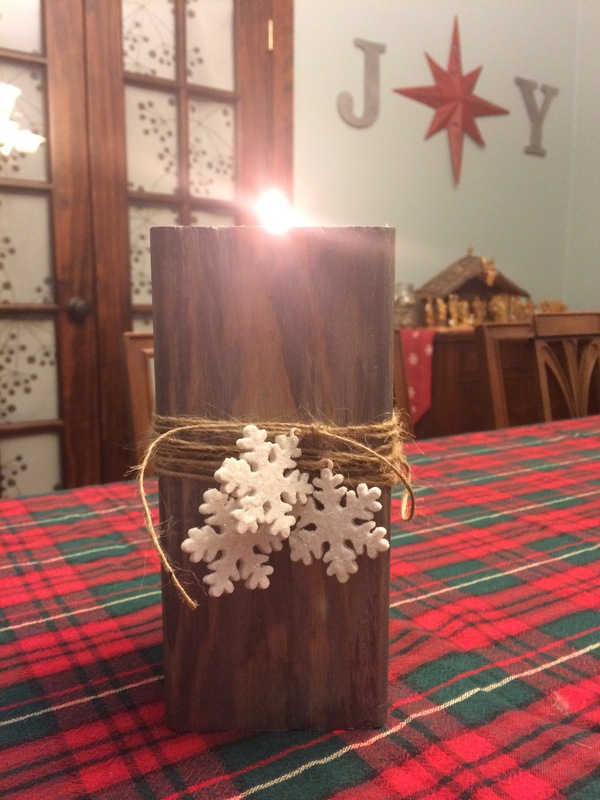 My daughter got married in May and like most newlyweds, she doesn’t have many Christmas decorations and she loves Christmas…so I made her some. 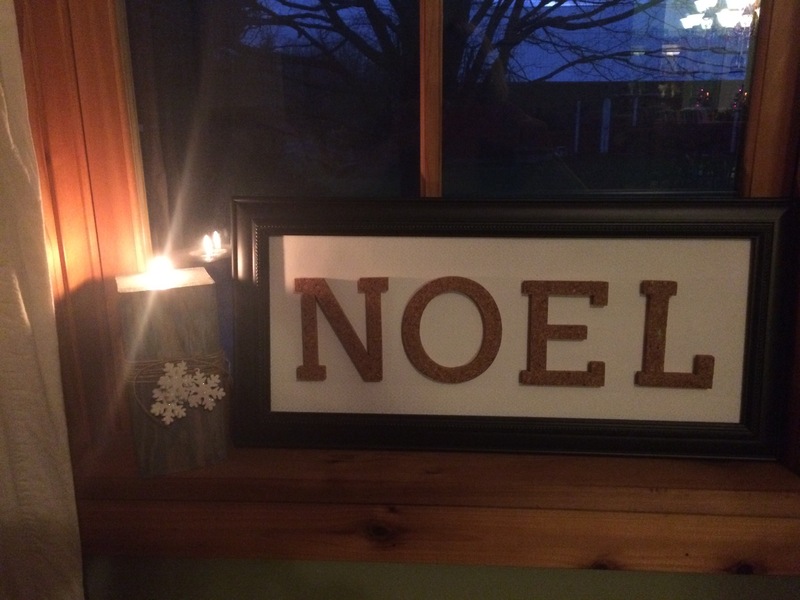 The letters on the Noel picture are cork and they are from the banner that was hanging at her high school graduation open house. The candle holder is from her wedding. It was fun getting my hands “dirty” . I hope the inspiration keeps coming! I have been busy collecting items to redo and reinvent. I’m excited to get started and I wanted to give you a little peek at the items i will be attacking soon. There are plenty more in the works, but I’ll save those for later. living with less. looking for more. A split second; that’s all it takes to change everything. On January 19th, (your dad’s 60th birthday, sorry dad.) you and your daughter are making the daily trek to work. It’s winter, the roads are slippery, so you’re using four wheel drive and taking it easy; but it doesn’t matter. The Jeep losses traction and you begin to slide. Planning & Dreaming & Learning, Oh My!